This common Brazilian greeting wishes everything good to others. The way Brazilians live and share the gospel with their neighbors is making the greeting come true. Question: What is the dominant language of South America? Answer: Portuguese, spoken in Brazil. The giant of South America has more people than the rest of the nations on the continent combined. With more than half a million Latter-day Saints, Brazil also has more Church members than any other nation on earth except the United States and Mexico (the latter has approximately three-quarters of a million members). The Church is numerically strong in other South and Central American countries too; in fact, there are some in which the proportion of Latter-day Saints in the general population exceeds or approaches that of the United States. But numbers are not the most telling measure of growth in any of these countries. More important is the effect of the gospel on people’s lives. In Brazil, Eduardo Naum and Antonio Camargo represent two perspectives on this gospel growth﻿—the comparatively young member and the pioneer. A handsome mid-level manager in his late twenties, Eduardo is bishop of the Ferreira Ward, São Paulo Brazil Taboão Stake. It is the second time since he joined the Church in 1991 that he has been called as a bishop. His extended family, who are not Latter-day Saints, wonder why he is not paid for all the hours he spends in his Church calling. “I work for the Lord,” he reflects. “What I have learned from my service is that Jesus lives﻿—surely. He is there for each of us.” That assurance alone is a priceless blessing worth any sacrifice of time. Bishop Naum sees Church growth in terms of the spread of gospel blessings among individuals and families. Thinking of friends with troubled lives or faltering marriages, he says that the gospel, with its teachings on love and cooperation and its help in overcoming pride and selfishness, could make an eternal difference to them. Antonio Camargo, a longtime executive in Brazil for a U.S.-based company, has seen the Church come out of obscurity during his five decades as a member. The callings he has held since his baptism (on 8 March 1947 in Campinas) are indicators of the Church’s growth toward maturity in Brazil. In 1966, for example, he was called as a counselor in the presidency of the São Paulo Stake﻿—his country’s first stake. He later served as a regional representative twice. Currently he is patriarch of the Taboão stake and a sealer in the São Paulo Temple. The major challenge for the Church during those coming years will probably be managing and responding to rapid growth. Some meetinghouses here accommodate four or five wards; some wards or branches squeeze into buildings that double as institute facilities during the rest of the week. In an average month, missionaries in Brazil may baptize enough new members to fill a stake. During May of 1995, for example, 4,012 new converts were baptized. Of those, 1,051 were men. (Approximately 25 percent of all convert baptisms in the past two years have been males.) Members of the Brazil Area Presidency believe that with proper support and seasoning in the gospel over time, these men will become strong leaders in their homes and will be priesthood leaders of the future. “There has to be a very careful blend of the effort to baptize, the effort to build spirituality, and the effort to retain converts,” says Elder Dallas N. Archibald of the Seventy, Area President. In the effort to baptize, missionaries know that men generally do not respond as well to a direct approach about spiritual values as women. But fathers do respond to ideas or concepts that promise help with their families. In teaching them what the gospel has to offer, missionaries think in terms of PAIS-F: the purpose (Propósito) of the Church﻿—strengthening families on earth and providing saving ordinances for their members; true friends (Amigos) through the gospel; loving, supportive social integration (Integração); the blessings of physical health (Saúde) through the Word of Wisdom; and, last, the family (Família) united forever. And in Portuguese, pais means fathers. Missionaries remember the five words of the PAIS-F acronym by ticking them off on four fingers and a thumb, so they have developed a shorthand way of indicating to companions that an investigator family (including an interested father) looked promising﻿—they hold up the four fingers of one hand, followed quickly by the thumbs-up sign. “How long does it take to ‘cure’ a member in the Church?” he asks. In Brazil, priesthood and auxiliary leaders are called on to provide all possible support for at least a year, until the new member family enters the temple to be sealed. Following direction from the Quorum of the Twelve Apostles, the Brazil Area Presidency has asked missionaries to spend as much as a third of their time helping to bring back members who are not currently enjoying all the blessings of the gospel. The intent is to put the less active on the path to the temple too, with the same full support given to new converts. The Church is growing well across the vast reach of Brazil. Representative members can be found in four of the country’s major population centers: São Paulo, Rio de Janeiro, Recife, and Curitiba. Rapidly growing metropolitan São Paulo, where traffic crawls bumper to bumper through the downtown financial district in the middle of any weekday afternoon, may be home to as many as 20 million paulistas﻿—residents of the state of São Paulo. From the top of a tall building downtown, office and apartment buildings stretch out almost as far as the eye can see in every direction. Greater Rio de Janeiro, the resort and recreation area known worldwide, accommodates an estimated 10 million people in neighborhoods and business districts meandering around bays and inlets and mountains that rise up suddenly out of the earth. Recife in the north, with its luxury high-rise hotels on the beach and old colonial buildings under tropical palms in nearby Olinda, has about 3 million people in its metropolitan area. Curitiba in the south, with pleasant parks, interesting theaters, and historic squares that show a commitment to heritage and culture, has an estimated 2 million-plus inhabitants. Looking at some of the members in these areas, it is easy to see how the gospel is shaping Brazilian lives. Otavio and Setsuko Nagata of the Vila Perneta Branch, Curitiba Brazil Tarumã Stake (he is branch president), are second-generation Brazilians﻿—among the many in this country whose ancestral lines go back to another land within two or three generations. Brazil’s Portuguese heritage is strong, but there is also broad representation from throughout Europe and other areas. There is a large ethnic Japanese population with many ties to the ancestral homeland. Do the Nagatas consider themselves Brazilian or Japanese? “First, we are Latter-day Saints,” Brother Nagata says﻿—then Brazilians. But he adds that their lives are blessed by the combined heritages of the gospel, their Japanese ancestry, and their Brazilian culture. Both Brother and Sister Nagata served missions in Brazil. He has been a bishop or in a bishopric or branch presidency for 15 of their 20 years of marriage. For Sister Nagata, spiritual experiences with both her deceased father and grandfather have underscored the importance of temple ordinances to her family. The strengthening influence of the gospel is an anchor, they say, in their lives and the lives of their four children: Spencer, Hyrum, Camilla, and Patricia. Brazilian members appreciate the need for constant reinforcement of gospel standards in their lives. The religious values that once were so prevalent in their society have been much diluted as people face constant bombardment by all the temptations of the modern world. Latter-day Saint adults and youth here draw strength from everything the Church has to offer, including Sunday worship, daily gospel study, seminary and institute classes, and strong auxiliary programs. “During the camp, they’re not girls from different wards,” Sister Linhares emphasizes. “They become part of one group.” In addition to the goals they achieve, they form strong friendships with other Latter-day Saint girls. They enjoy the experience of being out in nature, Sister Linhares says﻿—and they are out of the cities during carnavál. That week, celebrated as Mardi Gras in the United States, frequently features immodesty and immorality paraded through the streets, youth leaders say, so they schedule Young Men and Young Women camps then. Last year there were 12,000 Brazilian young women and 14,000 young men at camp in rural areas located a safe distance from the worldly influence of carnavál. Eighteen-year-old Lilian Fernanda Pereira Santos of the Tijuca Ward, Rio de Janeiro Brazil Andaraí Stake, is one of the young Brazilians trying to walk by faith. Fernanda says having friends she can associate with in her early-morning seminary class makes it easier to live the gospel and find wholesome activities. She used to be the only Latter-day Saint in her school, but now there is one more﻿—a young woman, recently baptized, whom Fernanda introduced to the gospel by inviting her to seminary. Ozair Ribeiro, a fireman, is bishop of the Guaraituba Ward, Curitiba Brazil Bacacherí Stake. After he and his wife and a handful of others joined the Church in 1990, the stake presidency organized a small group of Latter-day Saints in their city. Since then that group has grown to a ward that has been divided once and is swelling the ranks again. In 1996 it was averaging five to eight baptisms each Sunday. “The whole ward is involved in missionary work,” the bishop says. Every two weeks he schedules a “day of harvest” on which members bring referrals to the missionaries. The São Paulo Brazil Stake celebrated its 30th anniversary in 1996 with a missionary open house showing what the Church has to offer families. Those who attended were able to experience real Relief Society, Young Women and Young Men, or Primary lessons; in the Primary section, for example, they learned how to sing “I Am a Child of God” and created a picture they could take home with them. The help of local members is essential because the missionaries available to serve in Brazil are thinly spread. Elder Archibald cites many cities of 50,000 to 200,000 people that have never had missionaries. The country has enough people for 85 missions, if it had missions in proportion to some other South American countries﻿—but currently it has only 23. So where will Brazil get the additional missionaries it needs? About 3 percent of the 44,000 young Brazilian members of missionary age currently serve missions, says President D. Birch Larsen of the Missionary Training Center in São Paulo. The goal is to increase that number by tenfold. The MTC is moving into a new facility this year. While the old one could handle about 2,000 missionaries per year, the new one will accommodate six times as many. But what the missionaries are being trained to do is still characterized by a painting the MTC president treasures. It was the work of Walter Spat, the first stake president in Brazil, who was originally taught and baptized by a young Birch Larsen and his missionary companion almost 50 years ago. The painting shows a back view of the lower legs of two missionaries kneeling in prayer, holes worn in their shoe soles by their daily work. Approximately 40 percent of the missionaries serving in Brazil are natives of the country. Their experiences in the mission field will help make them into leaders, the future strength of the Church in their areas, when they go home. President Dolimar Fagundes Batista of the Rio de Janeiro Brazil Andaraí Stake says returned missionaries prepared to be leaders can be a great help. Leadership often is a problem where the population is very mobile. Some 4.5 million people live within the boundaries of President Batista’s stake, and they range from very rich to very poor. In Brazil’s sometimes difficult economy, even middle class members may have to move frequently as they seek work opportunities. But this often results in an experienced leader moving into an area where he and his family are truly needed. The Lord can raise up leaders wherever they are needed, President Batista says, because the strength of members in Brazil is that there are so many whose hearts and minds are centered on eternal values. Demar Staniscia, first counselor in the presidency of the MTC, has served in a number of leadership callings, including mission president (Brasilia, 1985–88) and regional representative. He was president of the São Paulo stake when the São Paulo Temple was built. It was a privilege, a humbling spiritual experience, for him to help make blocks for the temple with his own hands. That is the kind of feeling that many Brazilian leaders and members have for the temple. For some members, temple covenants offer strength in the face of trials that few could endure. Soft-spoken Antonio Edison Berrocal manages government highway projects. A member of the Ahú Ward, Curitiba Brazil Bacacherí Stake, he joined the Church alone in 1988. It took a few years before his wife was prepared to join with their five children. Then, he recalls, “the gospel ran in our blood, in our veins. We were doing everything the gospel asks us to do, day after day,” to fulfill their goal of being sealed in the temple. The family was on their way to the temple, in fact, when they were in a car accident. Only Brother Berrocal survived; he awoke in the hospital to learn that his wife and children had already been buried. The São Paulo Temple is so busy that on weekends its sessions run straight through from Friday morning to late Saturday night. Stakes are assigned a time in the temple﻿—beginning, perhaps, Saturday at 2:00 A.M.﻿—and distant ones schedule their buses to arrive in time for members to be ready at the appointed hour. Happily, ground has now been broken for another temple in Brazil, at Recife, approximately 1,200 miles northeast of São Paulo. Members in northern Brazil are eagerly looking forward to the day when the temple will be dedicated on the spot of ground that used to be covered only with palm trees, vines, and tropical plants. João Antonio Dias, second counselor in the presidency of the Recife Brazil Boa Viagem Stake, is one of the members who feel a sense of mission in connection with this temple. When he retired from the Brazilian army in 1988, he was planning to return to Brasilia, where he once had been stationed and had served as bishop. 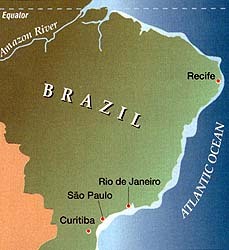 But his family was established in Recife at the time, and he was eventually called as a regional representative. Somehow the return to Brasilia never worked out. “I believe that the Lord has something for me to do here,” he says. “I really think my stay is related to the temple. I want to work in it.” He has had the privilege of being a temple ordinance worker before, in the United States when his army assignment took him to Washington, D.C., in the 1980s. Years ago when he was a branch president, João Dias performed the marriage ceremony for Antonio José and Yone Mendonça, currently members of the Juiz de Fora Branch, Juiz de Fora District of the Brazil Rio de Janeiro Mission. Both have been stalwarts in the Church wherever they have lived, serving in a wide variety of leadership positions. Brother Mendonça was mission president in Recife and knows the blessings that a temple will bring to members there. He recalls people who sold their possessions, including most of their clothing, to finance a trip to the São Paulo Temple so they could be sealed as husband and wife or as families. He and his wife have seen what he calls “miracles” of growth in the Church, both in terms of expanding membership and personal spiritual development, as Brazilian members have become more self-reliant. Seeking the Spirit’s direction, well versed in Church procedures, these members move ahead confidently in their callings. Achilles Miguel de Oliveira and his counselors in the elders quorum presidency of the Agua Branca Branch, Rio de Janeiro Brazil Madureira Stake, take a direct approach to helping the less active among the 34 elders and prospective elders in their quorum. They go beyond simply visiting with prayerfully selected brethren. They teach the gospel in the home and offer activities or quorum assignments to strengthen the individual. They encourage brethren to read the scriptures and hold family home evenings. Sometimes the less-active families are invited to family home evening in the homes of President Oliveira and his counselors so they will see how it can be done. The goal is to point the less-active families toward the blessings of the temple. Seeing the result﻿—seeing someone become spiritually vital again﻿—is the reward for sacrifices involved in serving. But in truth, Bishop da Silva says, his sacrifices seem small in comparison with blessings received. He pays tribute to his wife and family for their support and says they all have been blessed because of his calling. His attitude is indicative of what seems to be happening among Latter-day Saints in Brazil. Members give what they have to strengthen other individuals, and somehow the whole body of the Church becomes stronger at the same time. Spencer Nagata of Curitiba says he sees the gospel affecting his country in a way that President James E. Faust, now Second Counselor in the First Presidency, once described: the Church has grown to its current position of strength through the faithfulness “of millions of humble and devoted people who have only five loaves and two small fishes to offer in the service of the Master” (Ensign, May 1994, 6). And so it is in Brazil. Thousands of individual contributions in the service of the Master are nourishing a strong and growing family of Saints. Mathilde Felber joined The Church of Jesus Christ of Latter-day Saints when it was just taking root in her country, and she grew up with it. LDS missionaries in Brazil originally labored among German-speaking members who had settled in the southern part of the country. Mathilde, from a German-speaking Swiss family, first met the missionaries in 1938 when she was only 10, and it was three years before her father finally allowed his wife and daughters to be baptized, in December of 1941. During Mathilde’s years as an investigator and new member of the Church, North American missionaries were frequently visitors in her family’s home. These visitors included young elders James E. Faust and Wm. Grant Bangerter, along with a number of others she can name as she browses through her photo albums. The man Mathilde married, Enos de Castro Deus, attended meetings for five years, studying the doctrine carefully and even assisting the branch as requested before being baptized in 1952. He would not allow himself to take on membership with anything less than lifelong commitment in mind, and he wanted to be sure of the truth. Together, Enos, who passed away late last year, and Mathilde helped strengthen the Church in Curitiba for three generations. She has held leadership positions in each of the Church’s auxiliaries, including 17 years in Relief Society presidencies and callings at both the mission and stake levels. He was a branch president four times, bishop twice, a district president, and a counselor in branch, mission, and stake presidencies. He was deeply involved in planning construction of the first Church building in Curitiba at a time when the Church itself was still largely unknown there. “In the beginning, the Church grew very slowly,” Mathilde says. “It was difficult to baptize people here.” Now, the fruits of the gospel are seen in the lives of so many members who serve as missionaries by example that it’s much easier to talk to people about the Church. Milton Soares Jr. and his wife, Irene, are gracious hosts for visitors to the house he built and she landscaped in their quiet neighborhood in Recife. They have spent much of their lives in building﻿—building a family and building up the Church, which began here with them. They still have the first LDS pamphlet they received, the story of Joseph Smith, with a hand-drawn missionary diagram on the inside showing a church built on the foundation of Apostles, and with instructions suggesting the order of prayer. Another well-used Church book bears a message that the missionaries who taught Milton inscribed to him as the first person baptized in Recife in this dispensation. The date was 15 May 1960. His wife and children of baptismal age followed him into the Church three weeks later. Irene Soares was skeptical when her husband first began investigating the gospel, but knowing him to be a good man, she thought that if he could accept it, it must be right. She received her own strong witness of the truth when President Joseph Fielding Smith of the Quorum of the Twelve Apostles visited Recife in company with Elder A. Theodore Tuttle of the First Council of the Seventy. “I felt in my heart the knowledge that all we had been learning was true and that he [President Smith] was a prophet,” she recalls. In the beginning, when both of their families questioned why they would join this unknown church, Milton and Irene had only their faith to cling to. His family’s feelings toward the Church softened over time. The feelings of her parents and siblings did not, but she could not give up the truths she had found. Irene laughs when she remembers that “after just one week in the Church, I was considered an old-time member.” She felt a responsibility to meet and fellowship everyone. Her first sacrifice for the Church was to make cloths for the sacrament table. When their small branch moved to a different meetinghouse, Milton built the baptismal font and Irene found herself rounding up baptismal clothes. Like many other Brazilians who joined the Church when it was just getting started in their area, they planted the seeds of gospel growth for their family. And as in many other Brazilian families, their example has borne fruit in succeeding generations. Their eldest son, Irajá, is just one example. After his baptism as a teenager, he quickly learned to enjoy working with the missionaries. In 1966 he became the first Brazilian elder called on a full-time foreign mission (to Chile). Today he serves in the Church as an Area Authority. Above: Bishop Eduardo Naum, Ferreira Ward, São Paulo Brazil Taboão Stake. Top right: Sister missionaries, Missionary Training Center, São Paulo. Right: Bishop Mario Luiz de Souza da Silva, Madureira Ward, Rio de Janeiro Brazil Madureira Stake, with his wife, Rejane, son Tiago, and daughter Mariane. Background: A residential and business area of Rio de Janeiro. President Domingos Sávio Linhares, Jaboatão Litoral Stake, with young women gathered for a weeknight volleyball game. Left: Bishop Milton B. Santos, Capão Redondo Ward, São Paulo Brazil Santo Amaro Stake, with his wife, Isabel; daughters, Iris and Ivete, and son, Milton S. Santos. Background: Statue of the Savior overlooking Rio de Janeiro. Top: Fernanda Pereira Santos, Tijuca Ward, Rio de Janeiro Brazil Andaraí Stake. Above: Youth of Rio de Janeiro Brazil Andaraí Stake at a seminary activity. Below: Marcia Linhares, Young Women camp director for northeastern Brazil. Below: Urban São Paulo seems to stretch to the horizon in every direction. Background: Botanical garden in Curitiba. Mathilde Felber de Castro Deus of Curitiba examines photos of missionaries who served in Brazil when she was a girl. Above: Missionaries in a class, Missionary Training Center, São Paulo. Below: Norberto Lopes, São Paulo Brazil Stake mission president. Below left: Street scene, colonial Olinda, adjacent to Recife. Right: Lucirley Goncalves Ferreira, a student at the Brooklin LDS Institute, São Paulo. Milton Soares Jr. and his wife, Irene, LDS pioneers in Recife. Left: Ernestina Conceicão dos Santos, Curitiba Second Ward, Curitiba Brazil Stake, almost never misses a temple trip. Left below: Achilles Miguel de Oliveira Jr., elders quorum president, Agua Branca Branch, Rio de Janeiro Brazil Madureira Stake. Below: Children in the Vila Gomes Ward, São Paulo Brazil Stake. Background: São Paulo Temple.